The Chaplet of Divine Mercy is prayed in the Divine Mercy Chapel Monday through Saturday after 8 am Mass and the Rosary. It is offered for the conversion of sinners, those who will die that day, the Holy Souls in Purgatory, and special intentions. The Catholic Daughters conducts the Novena to the Divine Mercy on Good Friday at 3:00 pm--the Hour of Mercy-- and continues each afternoon through the Saturday vigil of Divine Mercy Sunday, the week after Easter. Per Jesus' request, the image of Divine Mercy, bearing the inscription "Jesus, I Trust in You," is venerated during the Feast Day Mass. 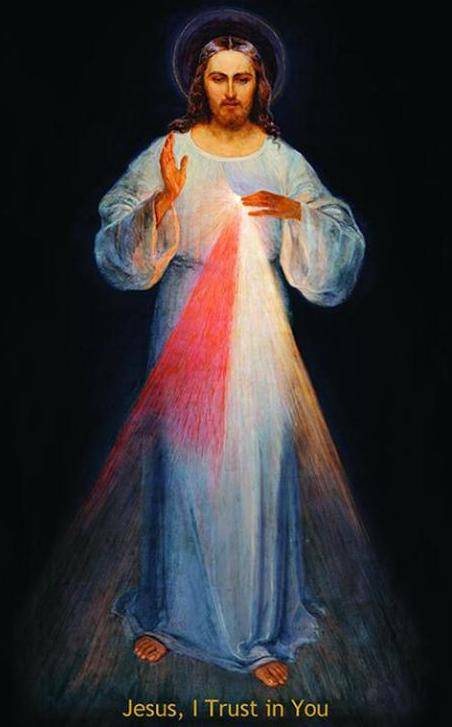 The devotion follows the Lord's revelation to St. Faustina in 1931 that God’s greatest attribute is His Mercy. 1. Make the sign of the Cross; 2. Say the optional Opening Prayer; 3. Say the "Our Father"; 4. Say the "Hail Mary"; 5. Say the "Apostles Creed"; 6. Say the "Eternal Father" ; 7. Say 10 "For the sake of His sorrowful Passion" on the "Hail Mary" beads; 8. Repeat for four more decades, saying "Eternal Father" on the "Our Father" bead and then 10 "For the Sake of His sorrowful passion" on the following "Hail Mary" beads; 9. At the conclusion of the five decades, say the "Holy God," the concluding doxology, three times; 10. Say the optional Closing Prayer.